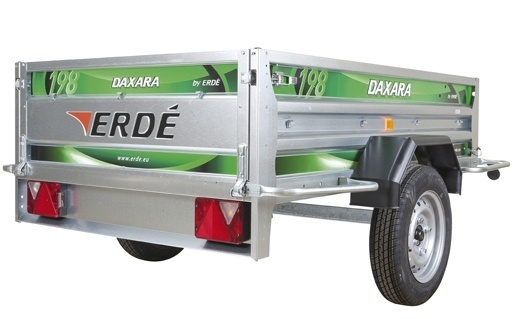 The Daxara 198.4 Trailer is the next model up from the Daxara 168.4 trailer with an extra 12 inches of useable space and still features the reinforced ‘A’ frame drawbar and 13 inch wheels. It is constructed from galvanised steel for strength and longevity and has a gross weight capacity of 750kg. The reinforced ‘A’ frame and double skin side panels further increase the robustness of the trailer and make it durable enough for more regular commercial use. As with all the Daxara trailers the rear panel/tailgate is removeable and along with the tipping feature allows for easier unloading of materials such as sand, gravel and earth. In addition to this the front panel opens and can also be removed on the Daxara 198.4 trailer. Finally, the 198.4 box trailer as with all Daxara trailers meets and exceeds the new type approval legislation being enforced as of October 2012. As a result each trailer produced to these standards has to be supplied with a Certificate of Conformity, an example of this certificate is included with the trailer images above.